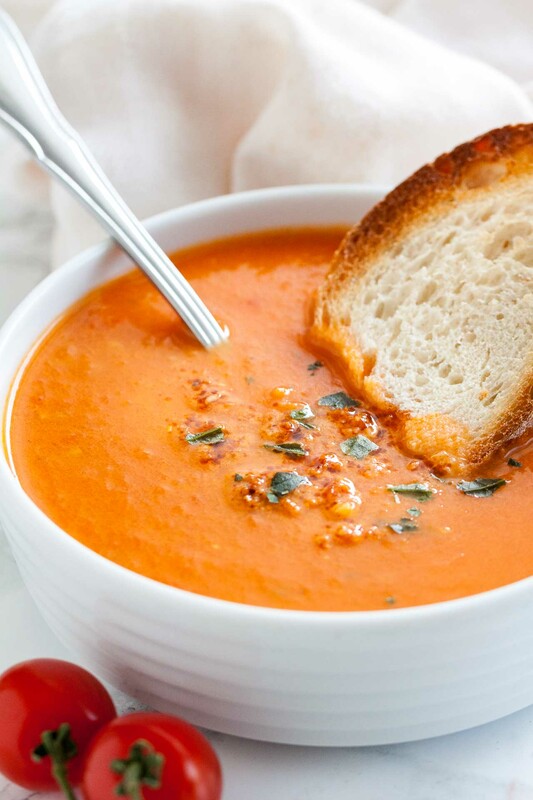 A creamy and healthy Roasted Tomato Soup that’s loaded with fresh flavors and super easy to make! 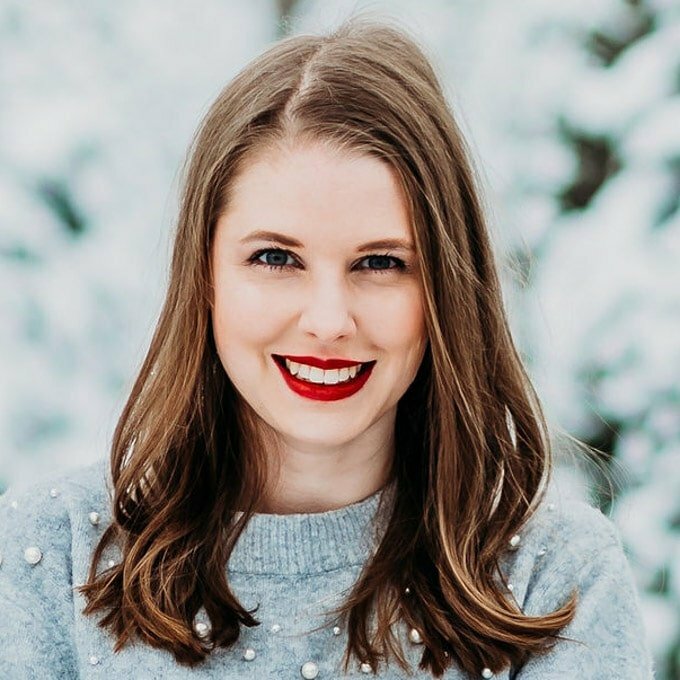 This easy tomato basil soup recipe is perfect for cold winter days, super tasty, and only has 182 kcal for a big bowl. 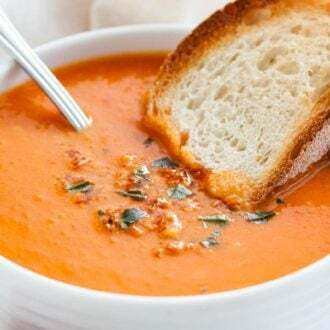 Creamy Roasted Tomato Basil Soup served with some rustic bread or grilled cheese sandwiches makes one of my favorite cold weather dinners! This soup is super creamy without much cream and roasting the tomatoes in the oven makes it so flavorful. This tomato soup is healthy but I didn’t make it deliberately healthier, it’s just how I make my tomato soup! It’s low in calories even so I added a good amount of cream because that’s how I like it. But you could also add less cream and this recipe would make a delicious soup too! I promise after you tried this recipe with roasted tomatoes you don’t want to eat normal tomato soup anymore! You need a large enough pot that’s oven safe and fits most of the halved tomatoes cut side down. You could also use a sheet pan for roasting the tomatoes and then transfer them to a stock pot before adding the stock and blending. The flavor of the soup depends on the quality of the tomatoes you use. I recommend using ripe organic tomatoes, these taste best in my opinion. 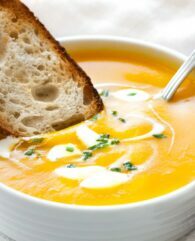 Add only as much cream as you like, this soup tastes great even without cream but I love a little bit of cream in it because it enhances the flavor and doesn’t add too many calories – this soup only got 182 calories for a big bowl! To make the soup start with preparing the tomatoes – LOTS of them. You’ll need 3.5lbs (1.6 kg) fresh tomatoes for this recipe. 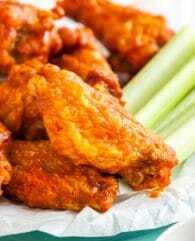 Cut them in half and slice off any hard cores while you saute the chopped onions and garlic. Place the tomatoes cut side down into the pan, sprinkle with sugar and drizzle a little bit balsamic vinegar over them. The tomatoes will start to caramelize which adds so much flavor. Don’t worry if you can’t fit all tomatoes cut side down into your pan. I always have to leave out a few halves which I add before I transfer the pan to the hot oven. Going the extra step and roasting the tomatoes in the oven makes them cook in their own juices which makes them soft and sweet. 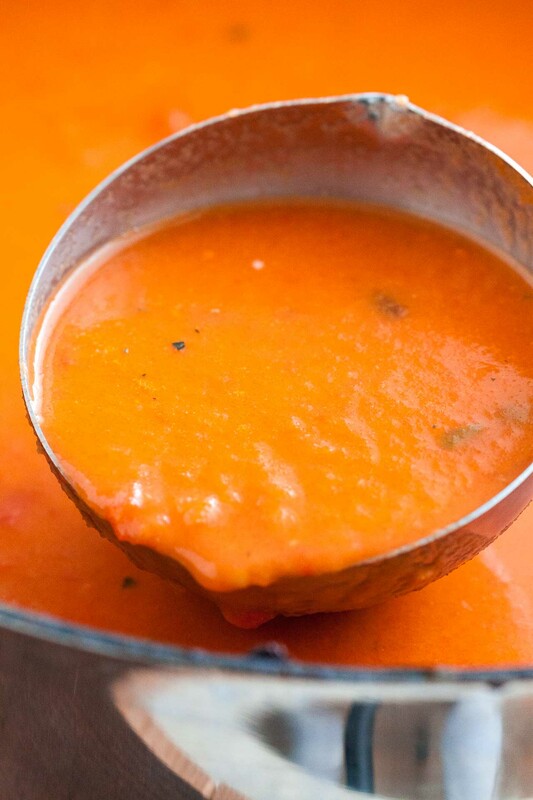 This will be the best tomato soup you’ve ever tasted, well worth making it from scratch! 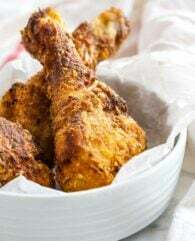 Once the tomatoes are cooked and soft, transfer the pan back to the stove, add the chicken or vegetable stock and the cream, and use a stick blender to whizz until smooth. The taste of the freshly roasted tomatoes is incomparable! This soup is creamy and full of flavor. This recipe makes a pretty big pot of this soup. 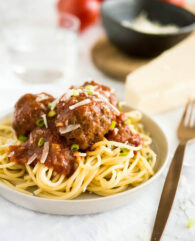 It serves 4-5 people comfortably especially with bread on the side. I always make the whole recipe even so we are just two because this soup makes great leftovers for lunch and it keeps fresh for a few days in the fridge. A perfect recipe for when tomatoes are on sale or you have an abundance of fresh tomatoes from your garden (I envy you!)! Immersion Blender: I love my hand blender! It’s great for making soups. You can blend right in the pot and it’s easy to clean and doesn’t need much space in my kitchen. Stockpot: You need a large enough stock pot for this recipe. I like to use a pot like this one because you don’t make a mess when you puree the soup with the immersion blender in the pot. 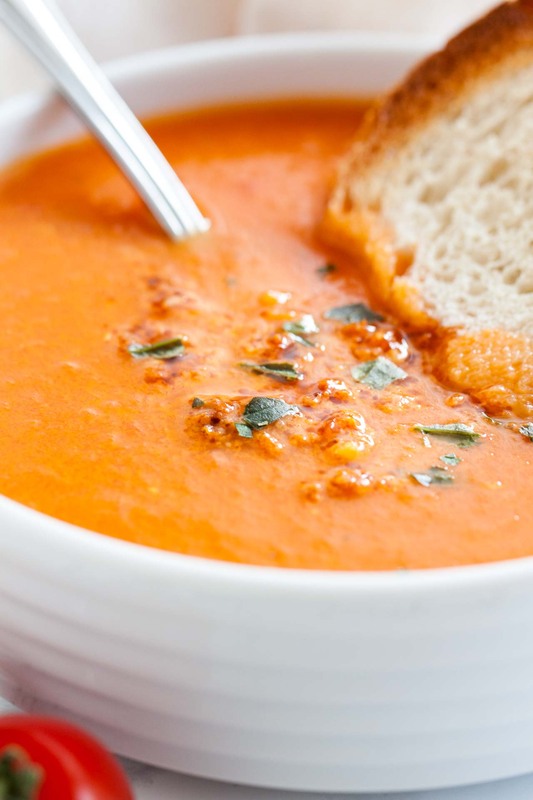 A creamy and healthy Roasted Tomato Soup that's loaded with fresh flavors and super easy to make! 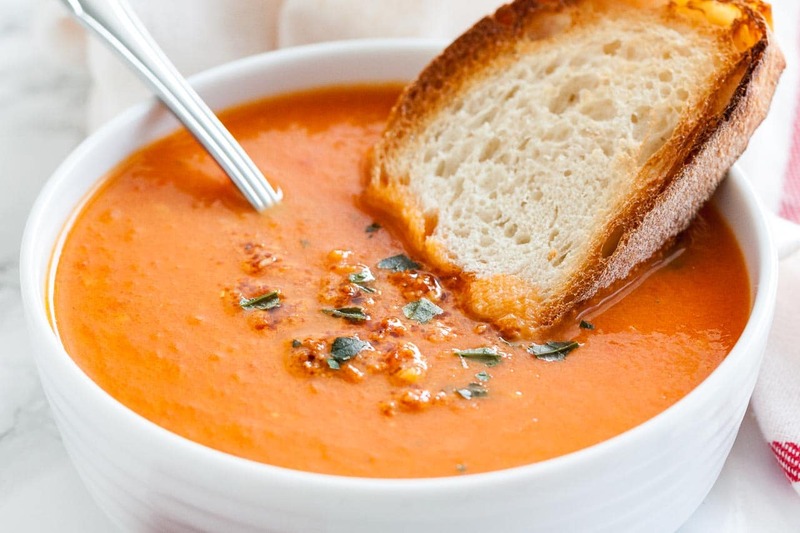 This easy tomato basil soup recipe is perfect for a cold winter day, super tasty, and has less than 200 kcal for a big bowl. 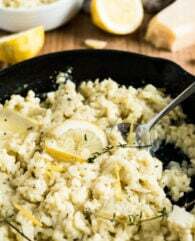 Serve it with rustic bread or grilled cheese sandwiches for dinner or lunch! Preheat the oven to 350°F (180°C). Slice the tomatoes in half and core them. Set aside. 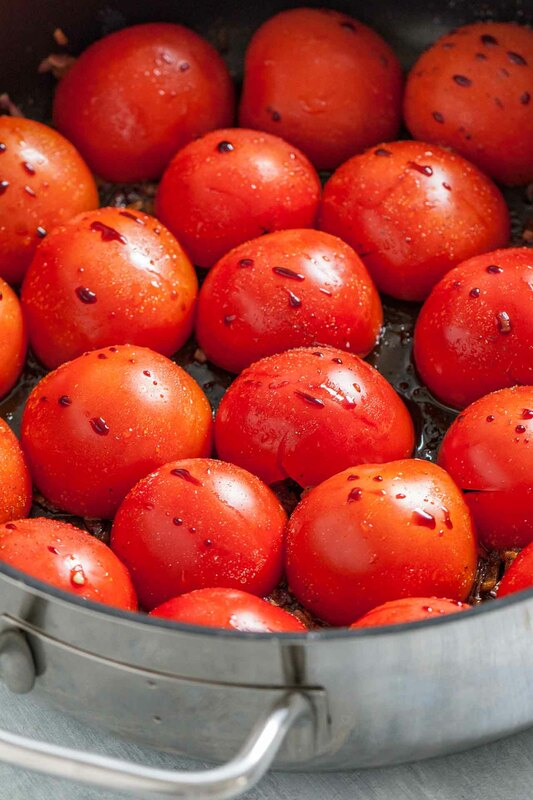 Heat up 1 tbsp olive oil in a roasting tray or oven-safe wide pot/pan big enough to fit all the tomatoes in one layer over medium-high heat. Add the chopped onions and saute for 3 minutes until translucent. Keep stirring constantly. Then add the sliced garlic and cayenne pepper, cook for 1 more minute. Place the tomato halves in one single layer cut-side down in the pan. Season with a little bit salt and pepper. 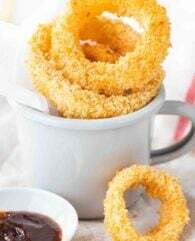 Sprinkle the sugar over the tomatoes and drizzle with balsamic vinegar. Cook over high heat for 4 minutes. Give it a good stir and transfer to the oven for 30 minutes. Transfer the tray/pot/pan carefully back to the stove (if you used a tray transfer tomatoes to a stock pot) and pour in the stock. Bring to a boil and let simmer for 4 minutes. Then add the cream and let cook for 2 more minutes. Blend the soup with an immersion blender until almost smooth. Stir in chopped basil and season to taste with salt and pepper as needed. 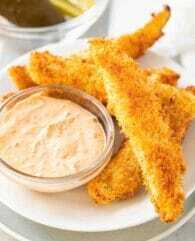 Serve with rustic bread or grilled cheese sandwiches. Serve this recipe with a dollop of Tomato Pesto for even more flavor. Adapted from my favorite Gordon Ramsay cookbook. 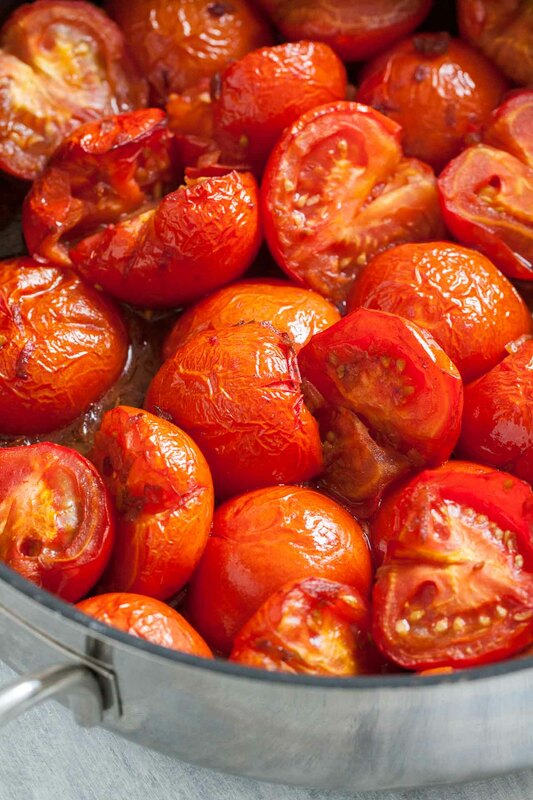 Roasting your tomatoes first is a fantastic idea! I bet this soup is just amazing, and perfect of fall! Wishing I had a big bowl right now!